I work on the Muon g-2 experiment, which is housed inside a brand new building at Fermilab. Next door, another experiment hall is under construction. It will be the home of the Mu2e experiment, which is slated to use Fermilab’s muon beam as soon as Muon g-2 wraps up in a few years. Mu2e will search for evidence of an extremely rare process — namely, the conversion of a muon to an electron in the vicinity of a nucleus. You can read more about muon-to-electron conversion in a previous post by Flip. Today, though, I bring you news of a different muon experiment, located at the Paul Scherrer Institute in Switzerland. The MEG experiment was operational from 2008-2013, and they recently released their final result. Figure 1: Almost 100% of the time, a muon will decay into an electron and two neutrinos. MEG (short for “mu to e gamma”) and Mu2e are part of the same family of experiments. They each focus on a particular example of charged lepton flavor violation (CLFV). Normally, a muon decays into an electron and two neutrinos. The neutrinos ensure that lepton flavor is conserved; the overall amounts of “muon-ness” and “electron-ness” do not change. Figure 2 lists some possible CLFV muon processes. In each case, the muon transforms into an electron without producing any neutrinos — so lepton flavor is not conserved! These processes are allowed by the standard model, but with such minuscule probabilities that we couldn’t possibly measure them. If that were the end of the story, no one would bother doing experiments like MEG and Mu2e — but of course that’s not the end of the story. It turns out that many new physics models predict CLFV at levels that are within range of the next generation of experiments. If an experiment finds evidence for one of these CLFV processes, it will be a clear indication of beyond-the-standard-model physics. Figure 2: Some examples of muon processes that do not conserve lepton flavor. Also listed are the current/upcoming experiments that aim to measure the probabilities of these never-before-observed processes. Outcome #1 is only possible if the branching ratio is high enough to produce a clear signal. Otherwise, all the experimenters can do is say “the branching ratio must be smaller than such-and-such, because otherwise we would have seen a signal” (i.e., outcome #2). MEG saw no evidence of μ+ → e+γ decays. Instead, they determined that the branching ratio is less than 4.2 × 10^-13 (90% confidence level). Roughly speaking, that means if you had a pair of magic goggles that let you peer directly into the subatomic world, you could stand around and watch 2 × 10^12 muons decay without seeing anything unusual. Because real experiments are messier and less direct than magic goggles, the MEG result is actually based on data from 7.5 × 10^14 muons. Before MEG, the previous experiment to search for μ+ → e+γ was the MEGA experiment at Los Alamos; they collected data from 1993-1995, and published their final result in 1999. They found an upper limit for the branching ratio of 1.2 × 10^-11. Thus, MEG achieved a factor of 30 improvement in sensitivity over the previous result. 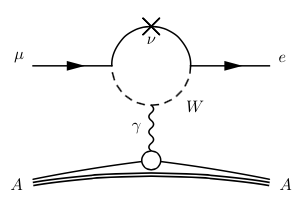 Figure 3: The MEG signal consists of a back-to-back positron and gamma, each carrying half the rest energy of the parent muon. A continuous beam of positive muons enters a large magnet and hits a thin plastic target. By interacting with the material, about 80% of the muons lose their kinetic energy and come to rest inside the target. Because the muons decay from rest, the MEG signal is simple. Energy and momentum must be conserved, so the positron and gamma emerge from the target in opposite directions, each with an energy of 52.83 MeV (half the rest energy of the muon).1 The experiment is specifically designed to catch and measure these events. It consists of three detectors: a drift chamber to measure the positron trajectory and momentum, a timing counter to measure the positron time, and a liquid xenon detector to measure the photon time, position, and energy. Data from all three detectors must be combined to get a complete picture of each muon decay, and determine whether it fits the profile of a MEG signal event. Figure 4: Layout of the MEG experiment. Source: arXiv:1605.05081. Is there a photon with the correct energy? Is there a positron at the same time? Did the photon and positron emerge from the target in opposite directions? Does the positron have the correct energy? Four yeses and you might be looking at a rare CLFV muon decay! However, the key word here is might. Unfortunately, it is possible for a normal muon decay to masquerade as a CLFV decay. For MEG, one source of background is “radiative muon decay,” in which a muon decays into a positron, two neutrinos and a photon; if the neutrinos happen to have very low energy, this will look exactly like a MEG event. In order to get a meaningful result, MEG scientists first had to account for all possible sources of background and figure out the expected number of background events for their data sample. In general, experimental particle physicists spend a great deal of time reducing and understanding backgrounds! The MEG collaboration is planning an upgrade to their detector which will produce an order of magnitude improvement in sensitivity. MEG-II is expected to begin three years of data-taking late in 2017. 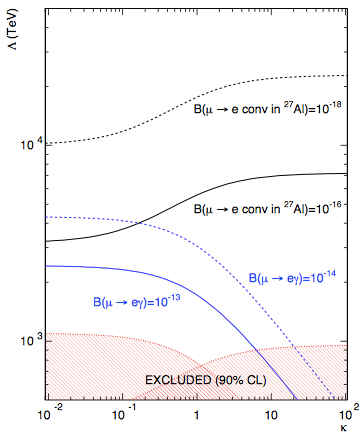 Perhaps at the new level of sensitivity, a μ+ → e+γ signal will emerge from the background! 1 Because photons are massless and positrons are not, their energies are not quite identical, but it turns out that they both round to 52.83 MeV. You can work it out yourself if you’re skeptical (that’s what I did). Not all searches for new physics involve colliding protons at the the highest human-made energies. An alternate approach is to look for deviations in ultra-rare events at low energies. These deviations may be the quantum footprints of new, much heavier particles. In this bite, we’ll focus on the decay of a muon to an electron in the presence of a heavy atom. Muons conversion into an electron in the presence of an atom, aluminum. They decay, and the decay products always include an electron that can be detected. In vacuum it will decay into an electron and two neutrinos through the weak force, analogous to beta decay. These decays are sensitive to virtual effects. You don’t need to directly create a new particle in order to see its effects. Potential new particles are constrained to be very heavy to explain their non-observation at the LHC. However, even these heavy particles can leave an imprint on muon decay through ‘virtual effects’ according (roughly) to the Heisenberg uncertainty principle: you can quantum mechanically violate energy conservation, but only for very short times. Reach of muon conversion experiments from 1303.4097. The y axis is the energy scale that can be probed and the x axis parameterizes different ways that lepton flavor violation can appear in a theory. One should be surprised that muon conversion is even possible. The process cannot occur in vacuum because it cannot simultaneously conserve energy and momentum. (Puzzle: why is this true? Answer below.) 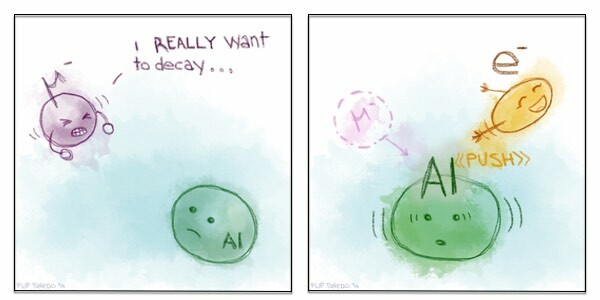 However, this process is allowed in the presence of a heavy nucleus that can absorb the additional momentum, as shown in the comic at the top of this post. Muon conversion experiments exploit this by forming muonic atoms in the 1s state and waiting for the muon to convert into an electron which can then be detected. The upside is that all electrons from conversion have a fixed energy because they all come from the same initial state: 1s muonic aluminum at rest in the lab frame. This is in contrast with more common muon decay modes which involve two neutrinos and an electron; because this is a multibody final state, there is a smooth distribution of electron energies. This feature allows physicists to distinguish between the conversion versus the more frequent muon decay in orbit or muon capture by the nucleus (similar to electron capture). The Standard Model prediction for this rate is miniscule—it’s weighted by powers of the neutrino to the W boson mass ratio (Puzzle: how does one see this? Answer below.). In fact, the current experimental bound on muon conversion comes from the Sindrum II experiment looking at muonic gold which constrains the relative rate of muon conversion to muon capture by the gold nucleus to be less than . This, in turn, constrains models of new physics that predict some level of charged lepton flavor violation—that is, processes that change the flavor of a charged lepton, say going from muons to electrons. The plot on the right shows the energy scales that are indirectly probed by upcoming muonic aluminum experiments: the Mu2e experiment at Fermilab and the COMET experiment at J-PARC. The blue lines show bounds from another rare muon decay: muons decaying into an electron and photon. The black solid lines show the reach for muon conversion in muonic aluminum. The dashed lines correspond to different experimental sensitivities (capture rates for conversion, branching ratios for decay with a photon). Note that the energy scales probed can reach 1-10 PeV—that’s 1000-10,000 TeV—much higher than the energy scales direclty probed by the LHC! In this way, flavor experiments and high energy experiments are complimentary searches for new physics. These “next generation” muon conversion experiments are currently under construction and promise to push the intensity frontier in conjunction with the LHC’s energy frontier. Why do pions decay into muons and not electrons? [Note: this requires some background in undergraduate-level particle physics.] One might expect that if a charged pion can decay into a muon and a neutrino, then it should also go into an electron and a neutrino. In fact, the latter should dominate since there’s much more phase space. However, the matrix element requires a virtual W boson exchange and thus depends on an [axial] vector current. The only vector available from the pion system is its 4-momentum. By momentum conservation this is $p_\pi = p_\mu + p_\nu$. The lepton momenta then contract with Dirac matrices on the leptonic current to give a dominant piece proportional to the lepton mass. Thus the amplitude for charged pion decay into a muon is much larger than the amplitude for decay into an electron. Why can’t a muon decay into an electron in vacuum? The process cannot simultaneously conserve energy and momentum. This is simplest to see in the reference frame where the muon is at rest. Momentum conservation requires the electron to also be at rest. However, a particle has rest energy equal to its mass, but now there’s now way a muon at rest can pass on all of its energy to an electron at rest. Why is muon conversion in the Standard Model suppressed by the ration of the neutrino to W masses? This can be seen by drawing the Feynman diagram (fig below from 1401.6077). Flavor violation in the Standard Model requires a W boson. Because the W is much heavier than the muon, this must be virtual and appear only as an internal leg. Further, W‘s couple charged leptons to neutrinos, so there must also be a virtual neutrino. The evaluation of this diagram into an amplitude gives factors of the neutrino mass in the numerator (required for the fermion chirality flip) and the W mass in the denominator. For some details, see this post.